Location: 4660 N. Nevada Ave. Hours: Monday – Thursday: 11 a.m. to 9 p.m., Friday: 11 a.m. to 10 p.m., Saturday 11 a.m. to 9 p.m. When you crave an authentic, sit-down Mexican dinner that offers fresh, homemade meals, look no further than Señor Manuel Mexican Cuisine. Located at the bottom of the hill from UCCS, Señor Manuel Mexican Cuisine is a typical hole-in-the-wall Mexican restaurant. It has simple décor, fairly priced menu items and friendly service. Open since 1970, Senor Manuel has been a family operated business for four generations. According to their restaurant’s history, founders Manuel and Lucy Hernandez, “believed that their patrons should be welcomed as if they were guests in their own home”. This is exactly how I felt when I entered the establishment. I was warmly greeted then quickly shown to a seat. At 7 p.m. on a Saturday, no reservation was needed. If students choose not to go at this time, they can also take advantage some special offers during the week, such as $1 off all appetizers during Fiesta Hour, which is from 4-6 p.m. Monday-Friday and all day Saturday. Breakfast items appear to be served throughout the day, and all lunch menu items are only $7.95 from 11 a.m. to 3 p.m. Monday-Friday. The service we received was timely. Within five minutes of sitting down, a waitress came by to take our drink orders. For those over the age of 21, I would recommend the house favorite: Manny’s margarita. Afterward, our waitress soon brought us the complimentary homemade corn chips and salsa. Both the corn chips and tortillas are made in house in the restaurant’s tortilla factory located in the basement of the building. The tortilla factory not only sells homemade chips and tortillas, but also a variety of their salsas, sauces, guacamole, pico de gallo, tamales and more. The waitress was also thorough in describing some of her personal favorite dishes on the menu as well as some house-recommended dishes. After we ordered our meals, we only had to wait about 15 minutes before our steaming hot entrees were served. I ordered the Giant Chicken Enchilada ($13.25) with rice and beans. The portion size was surprisingly large. Even with a full appetite, I was only able to get through half of my meal. The shredded chicken was very moist and full of flavor. The homemade flour tortilla gave the dish that extra fresh taste which nicely balanced out the sweetness of the sauce. The refried beans and rice added a nice texture to the meal and helped absorb some of those flavors from the dish’s red sauce. The waitress made one or two stops during the course of our evening to check in and make sure everything was to our liking. It was quite easy to carry on a conversation, uninterrupted by neighboring tables or overhead music. During our two-and-a-half hours at the restaurant, it never felt too overcrowded and the noise level was kept at a pleasantly low volume. The other patrons in the restaurant ranged from college students to small families and local senior citizens. With mostly young waiters and hostesses, the restaurant definitely gave off that intimate, homey atmosphere. While the dining took place in the main restaurant, there was also a banquet room that can accommodate large parties on short notice. The banquet room includes a buffet-style meal, a full service bar and a dance floor. 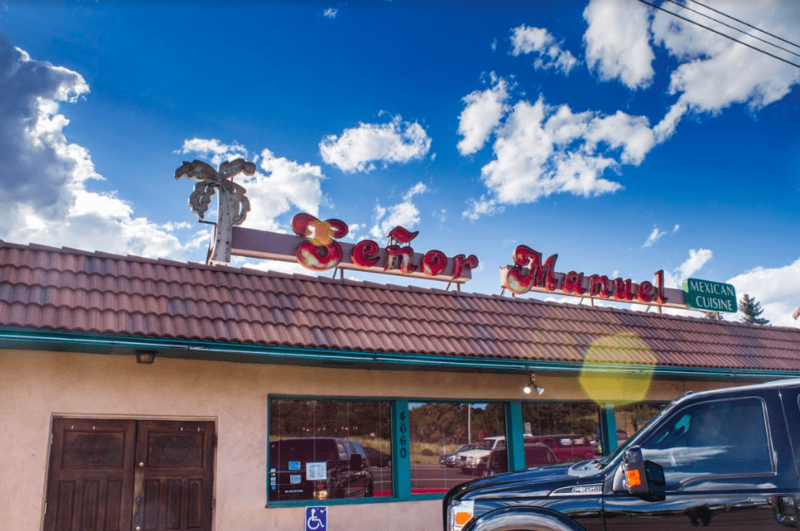 Although the exterior appearance of Señor Manuel makes it look like a dive or motel restaurant, the homemade cooking and friendly staff provide customers with a casual, affordable and filling dining experience.